In 1957 the AEC needed a place to test out an idea they had at Livermore Laboratories. The idea came from a young charismatic Italian physicist, Nicholas Christofilos, who worked for Edward Teller, the co-father of the H-Bomb. In those days Livermore Laboratories had punch with the Joint Chiefs, their star was ascendant, and they had gotten many contracts for weapons development that might have gone to Los Alamos National Laboratory. Livermore was still proving themselves, and they were hawkish and hostile to any weapon testing ban. And some of Teller’s ideas were outlandish. A nuclear-powered spaceship, Project Ploughshares, which among other things, proposed the use of “clean” bombs to create a harbor at Katalla Alaska, a canal across the Alaska peninsula at Fort Molier, excavating oil from oil shale and creating artificial aquifers. But when these projects were talked about with local politicians in the sixties, there would be an air of nervousness. Would there be any…problems? Even devout conservatives would get reluctant about using nuclear explosives in our homeland. Even projects that only meant firing nuclear-armed rockets out to sea from Cape Canaveral or Vandenburg AFB would be vetoed by increasingly gun-shy American politicians. But Nicholas Christofilos’s idea looked, in those scary times, to be a defense against the newfound strength of the Soviet Union. The Soviets had the Sputnik up there flying overhead, they had big solid fuel boosters that could loft their megaton range warheads to U.S. targets, they were developing new satellites. Livermore told Eisenhower and General Curtis Le May that they might have a secret weapon that would enable us to knock down Soviet satellites, and intercept and destroy incoming ICBMs. Our weapon would be the Van Allen Belt, a magnetic band around the earth. If we could detonate a megaton range bomb (code-named TEAK) inside the Van Allen Belt, it might flood the belt with a lethal flood of X-rays and neutrons that could destroy computer memories, render solar panels useless, and destroy incoming Soviet missiles and their spy satellites orbiting in low orbits. In April 1958, the AEC sponsored Project Argus, three top-secret relatively small atomic tests high in space near the South Pole on the edge of the Van Allen belt. A presidential scientific commission headed by James Killian studied the data. It looked as if Christofilos was right. Washington decided to make it a top priority project to test out his ideas on a bigger scale. Detonate a warhead in the megaton range up in near-space and create a weapon that would have a kill range of five miles or so. With a really big bomb, a close miss to an ICBM reentry body would give you a kill. This meant adding two more tests to the already crowded HARDTACK 1 series underway in the Pacific: TEAK and ORANGE. Arm two Redstone IRBM missiles with two big 3.8 megaton W-39 warheads, and fire them from a new launcher under construction on Bikini atoll. Detonate them inside the Van Allen belt. All the testing they had been doing in the Eniwetok and Bikini had generated an enthusiastic audience in Hawaii. Fireworks year around. Joint Task Force 7.3 was even sending out press releases to let people know when they doing their shots. But TEAK and ORANGE were high altitude affairs, very powerful, and would be fired at nighttime, when there was more danger to people’s eyesight. More than three thousand people were living in the Marshall Islands area. Concerns were being raised that the flash would damage people’s retinas. There was no guarantee that natives would turn their heads away at the right time. Reverberations were continuing to be felt about radiation damage to islanders from early tests. Lewis Strauss, chairman of the United States Atomic Energy Commission, opposed the tests because of fears that the flash from the nighttime detonation might blind islanders who were living on nearby atolls. He finally agreed to approve the high-altitude test only the condition that the launch point be moved to the more remote site at Johnston Island. The Pacific Proving Grounds had run through its stock of political capital. The heydays of atmospheric testing in Eniwetok and Bikini and other atolls in our so-called Trust territories were over. We had bombed the hell out of Bikini and Eniwetok. In 1957 when the enormous Bravo shot at Bikini made the island of Eugelab disappear, public opinion began to turn against atomic testing. We had taken possession of the so-called “trust territories” from Japan when the war was over, only to turn some of the atolls of the western Pacific into radioactive no-man’s lands. The people of the United States were increasingly concerned about fallout. The enthusiasts for bigger and better inside the AEC were no longer in the ascendant, Lewis Strauss was retiring as head of the AEC, and no one in the administration was listening with awe to Edward Teller any more. President Dwight Eisenhower began to think about his legacy. Did he want to leave his nation in the midst of an arms race, or did he want to try for disarmament? Having James Killian as his science advisor freed him to do some fresh thinking . So it was that in 1958, he stunned the nuclear arms establishment by saying that the U.S. would declare a unilateral halt in atomic testing. He would make a number of initiatives to try to get serious talks going with Russia on a comprehensive test ban. The alphabet soup of agencies and groups and corporations building and testing atomic weapons were worried. Despite determined resistance by military officers at the highest level, what Ogle calls “political factors” triumphed. There would be no more testing in the Trust Territories. TEAK and ORANGE would be shot on Johnston Island. Starting in 1958, budgets were slashed for the testing program in the Pacific. Equipment was moved to Albuquerque, and the uncompleted launch site at Bikini was demolished. At the Pacific Proving Grounds they had had a vast area of sea and two large atolls with a diameter of from 18 to 20 miles. Johnston Island was just one small island you could walk around in 50 minutes. By October 31, 1958, the U.S. had tested 66 nuclear devices in the Marshall Islands. The U.S. government continued radiological surveys of the Marshalls and mounted cleanup activities to try to make contaminated areas habitable. In the meantime, the Bikini people have been relocated several times. 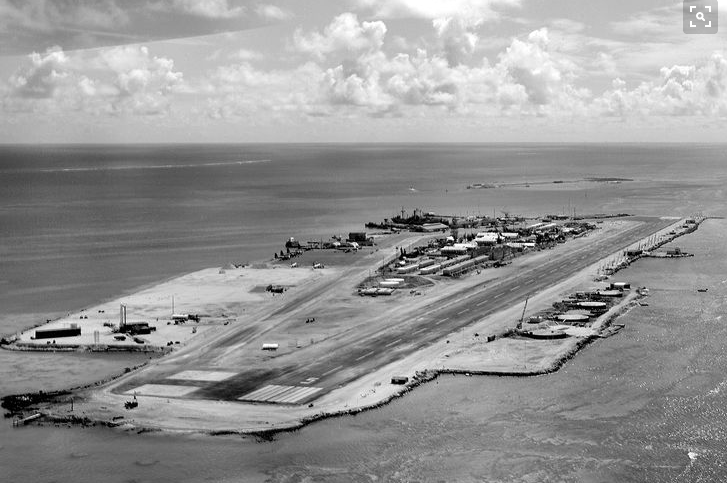 In 1980 the Enewetak people returned to their atoll, but insufficient food caused 100 of them to leave a year later. The Bravo shot that contaminated the atoll of Rongelap caused the Rongelapese to evacuate their home island. The scientists and military men who governed the Pacific Proving Ground had been the lords of these atolls between 1946 and 1957, but their time was coming to a close. Previous Previous post: “Well, what do you think about the “Black Lives Matter” sign on city hall?